Following from their 2015 release “EVOLVA 5”, Porya Hatami and Artificial Memory Trace continue their ongoing collaboration. Since 2014 the artists, based in Iran and Ireland respectively, have been exchanging field recordings from their local areas and processing them into otherworldly soundscapes. 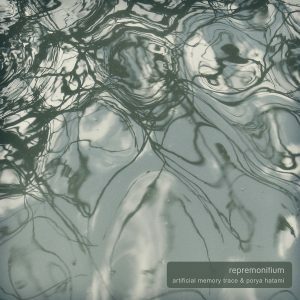 This extensive project’s latest chapter is “REPREMONITIUM”, a single piece lasting nearly 70 minutes and covering a lot of ground in its duration. Soft bell-like chimes flicker across the stereo field, the resonances of which grow into longer shapes and forms, until overtaken by more abrasive sounds that resemble Shepard tones, rising and falling, undulating into infinity. Darker moods are conjured in the middle section, more submersed, aquatic and buried. Varying from dense and super-structural, to ultra-minimal, the final third ends with the faintest of harmonics and distant melody. This is abstract sound art presented as a journey, where music isn’t so much played but implied. The found sound of everyday caught by microphones, constructed and composed.